SACRAMENTO (CelebrityAccess) — Golden 1 Credit Union and the Sacramento Kings announced a naming rights partnership establishing Golden 1 Center as the name for Sacramento’s under-construction entertainment and sports center scheduled to open in fall of 2016. As a result of the partnership, Golden 1 becomes the first credit union in the country to secure the naming rights for a major league professional sports venue. While the terms of the agreement were not disclosed, sources close to the deal told Sports Business Daily that the deal was worth $120M over 20 years, with an average annual value at $6M, making it one of the largest naming-rights deals for a single-tenant NBA arena. 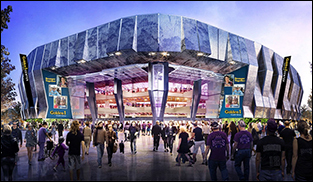 Construction of the 19,000-capacity Golden 1 Center got underway in October 2014 as part of a successful bid to keep the Kings in Sacramento, with a projected build cost of $477 million. "For more than 80 years, Golden 1 Credit Union has been investing in people by helping them make the most of their money and achieve their dreams," said Golden 1 President and Chief Executive Officer, Donna Bland. "Golden 1 Center demonstrates our continued commitment and investment in the people and future of Sacramento, while also advancing our ability to provide our members with more auto loans, affordable home loans, free checking and so many other valued and convenient financial services. Our future, our members' future, and Sacramento's future are one. We are very proud to invest in the community that has for so long invested in us."